The truism that Parisian coffee is terrible (and not in the French slang way where terrible actually means good) is slowly becoming a belief of the past. 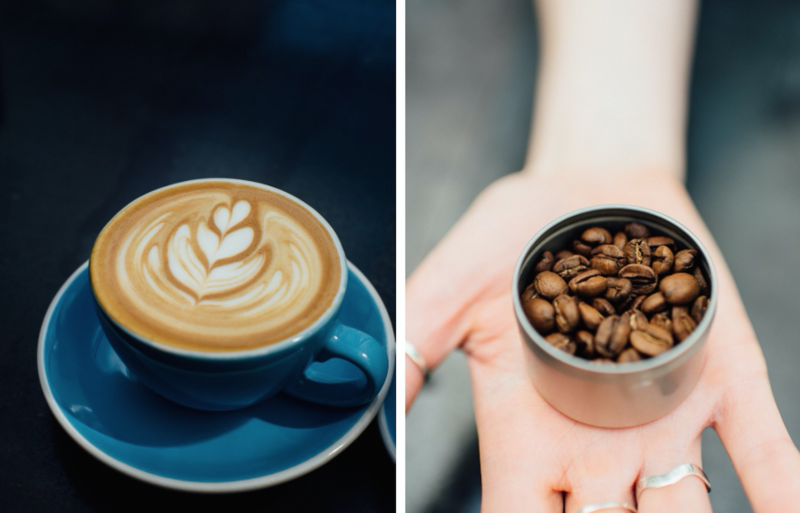 Thanks to the wave of cafés taking the reigns in delivering a premium cup of coffee using only quality beans, the picking, packing, and delivering are all considered in the process of making a proper cup of coffee. Expanding beyond the Cafés Richard variety, coffee in Paris is steadily revolutionizing from burnt-tasting to burgeoning. 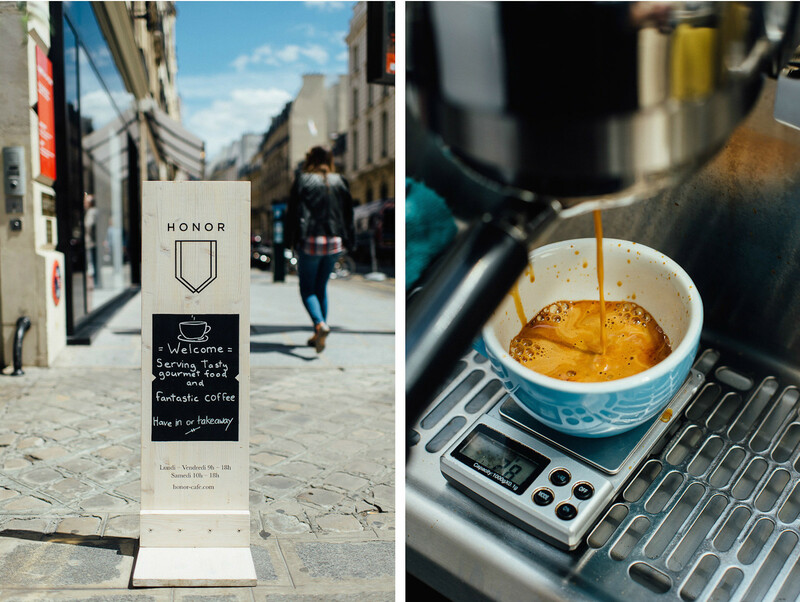 A new addition to the Paris coffee movement is Honor Café, where guests will delight in the fact that the quality of the coffee corresponds with the quality of the service. Before arriving where my directions sent me, to the tiny rue du Faubourg Saint-Honoré in the eighth arrondissement, I wondered where exactly among Givenchy and Yves Saint Laurent an independent coffee shop would find itself a home. Turning into a quintessential tucked-away Parisian courtyard, it then made perfect sense. 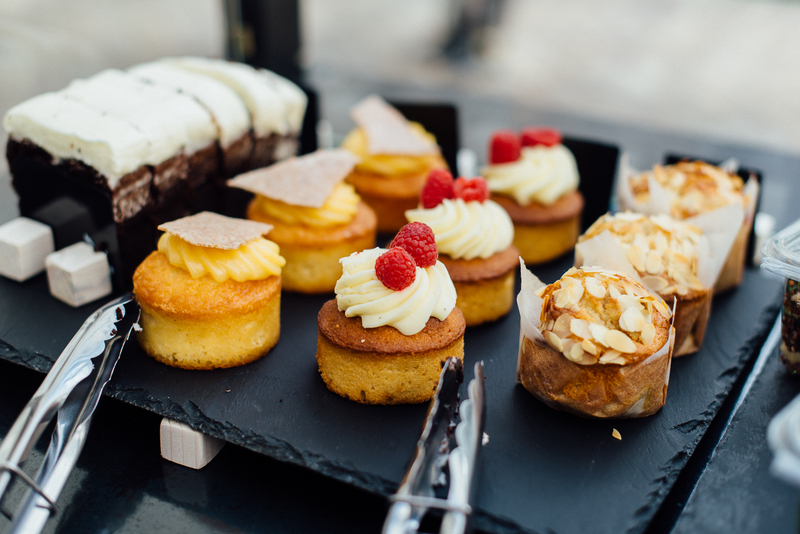 Mere steps from the sheen of the rue, which could rival that of Manhattan’s Madison Avenue, guests find calm within the cobblestone at Honor Café. Playing with the name of the street the café is located on, Honor Café also stands by their promise to provide an “experience in flavor,” with a clean and honest cup of filtered coffee using the reverse osmosis method to ensure a smooth taste. The minimal space was curated by the design team Studio Dessuant Bone and has a unique esthetic, clean in its detailing while inviting in its presentation. Having arrived only a year ago by way of London, coffee connoisseurs and founders Daniel Warburton and Angelle Boucher have impressively achieved the coveted expatriate dream of creating a vision to share with Paris. 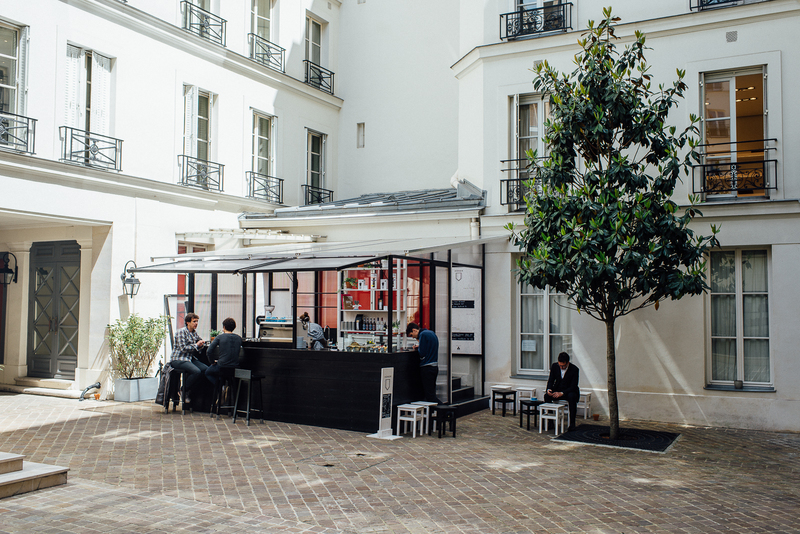 When presented with an opportunity to transform the Comme des Garçons courtyard into an outdoor independent coffee shop, they jumped on it. 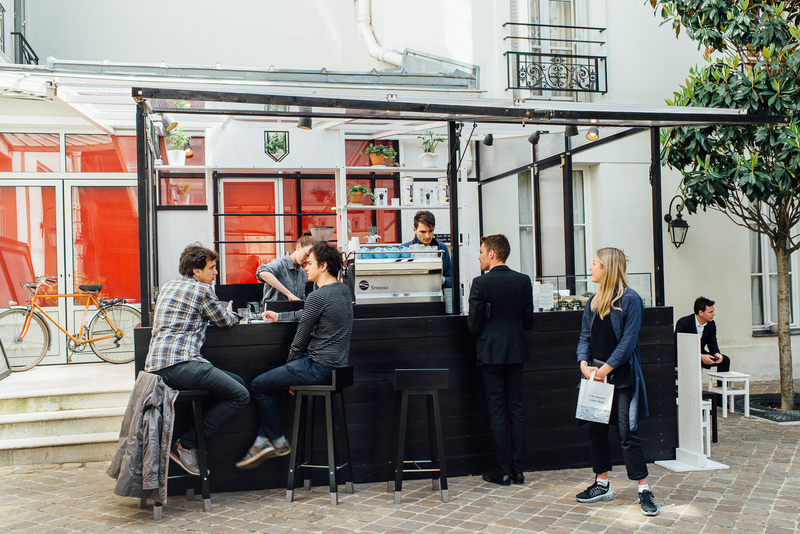 And with their doors opened just this past February, they are already making a name for themselves in the Parisian coffee scene, serving the fashion crowd of Saint Honoré, locals, and enthusiasts in search of a good cup of brew alike. With a passion for coffee, creative design, and hospitality, this café distinguishes itself as something truly special in the Paris coffee revolution. Scouts honor. We love Lisa’s taste in coffee, but also her taste in music. Check out her springtime Paris playlist. Explore the neighborhood around Honor Café with our guide to Paris’ elegant eighth arrondissement. Learn more about the Honor Café story from this T Magazine article. Written by Lisa Czarina Michaud for the HiP Paris Blog. All images by Jean-Marie Heidinger. Looking for a fabulous vacation rental in Paris, London, Provence, or Tuscany? Check out Haven in Paris. shops. Although, I am a big Starbucks fan for its service to travelers and locals alike.